Here’s a primer to keep the water-cooler conversation flowing when the subject turns to the California drought. Northern Sierra. Currently, precipitation is about half of average. The region’s 8-station precipitation index is at 27 inches, compared with a long-term annual average of about 50 inches. Mountain snowpack. It is 20 percent to 30 percent of average for this time of year – about as low as ever recorded. California, overall. The 2013-14 water year will probably end up being in the range of the third to fifth driest year in more than 90 years of recordkeeping. Because the previous two years were also quite dry, the state’s largest reservoirs are at about 50 percent of their average storage for this time of year. A few more inches could fall in the remainder of this water year. What makes this drought so bad? Though California has seen drier years, such as in 1976-1977, the current drought could be our worst in terms of measurable harm because we are demanding more of our water resources than ever before. Our population has never been larger. Prices for California crops have never or rarely been higher. And our expectations for preserving native fish and wildlife are as high as ever. Never before have we demanded so much of so little water. Will the California economy dry up? This drought will impose major hardships on many farmers, small communities and the environment. But it should not threaten California’s overall economy, which is less dependent on abundant water supply than in the past. Agriculture today accounts for less than 3 percent of the state’s $1.9 trillion a year gross domestic product. Such a large economy can help support those harmed by water shortages. The drought is mostly a reminder that living in a dry climate means we must manage water carefully. Eliminating irrigation in all urban areas would save enough water for only 15 percent of California’s agriculture. Expanding storage capacity above or below ground is useless without water to fill it; we are a water-short state. Reuse of urban wastewater would satisfy only 20 percent to 30 percent of urban water demands, at considerable expense and, often, with public angst. Ocean desalination is expensive and would raise the cost of water for the average California household by about $1,000 a year. Decreasing the required amount of river flows for fish and water quality during a drought can backfire. The reduction can further disrupt native species and establish new non-native species, leading to additional protections and listings of endangered aquatic species – which, in turn, reduce water available to farms and cities. Managing the effects of drought requires a range of actions carefully organized and analyzed together as a portfolio of measures with benefits and costs. California accomplishes a great deal with its limited water supply, supporting 38 million people, 9 million acres of irrigated cropland, a $1.9 trillion a year economy and highly-valued native ecosystems. We can accomplish more, but we can no more drought-proof California than we can earthquake-proof or fireproof the state. We can only manage water better and in more modern ways to serve California’s dynamic and diverse objectives. 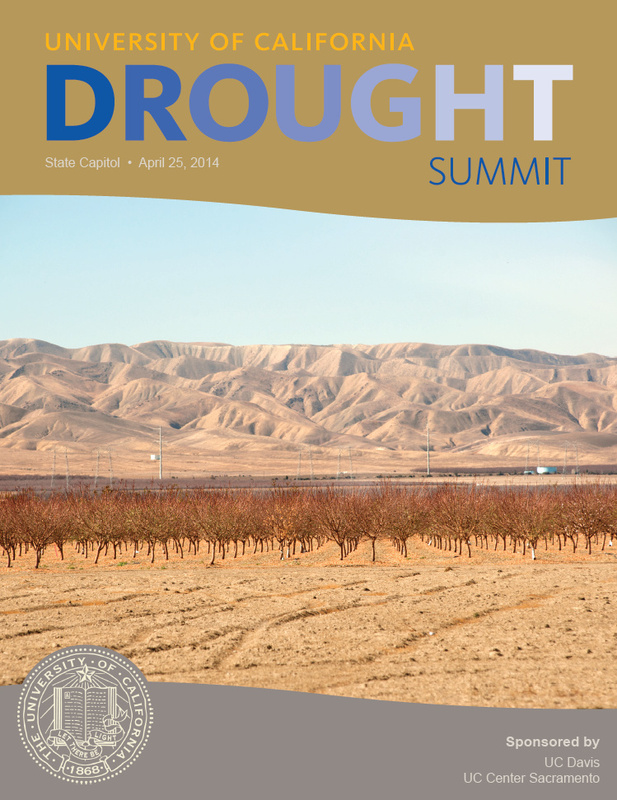 Please join us at the UC Drought Summit on Friday, April 25 in Room 4202 of the state Capitol. The daylong event is free and open to the public. Hosted by the Uc Davis Center for Watershed Sciences. This entry was posted in Uncategorized and tagged California drought, Jay Lund. Bookmark the permalink. A balanced presentation. It might be worthwhile to extend the data back another 3/4 century to downtown San Francisco. The current drought is not even in the top 10 of this dataset. There is decent proxy evidence that western U.S. drought was prevalent during the Medieval Warm Period and we have banked our civilization on an illusion of plentiful rainfall. 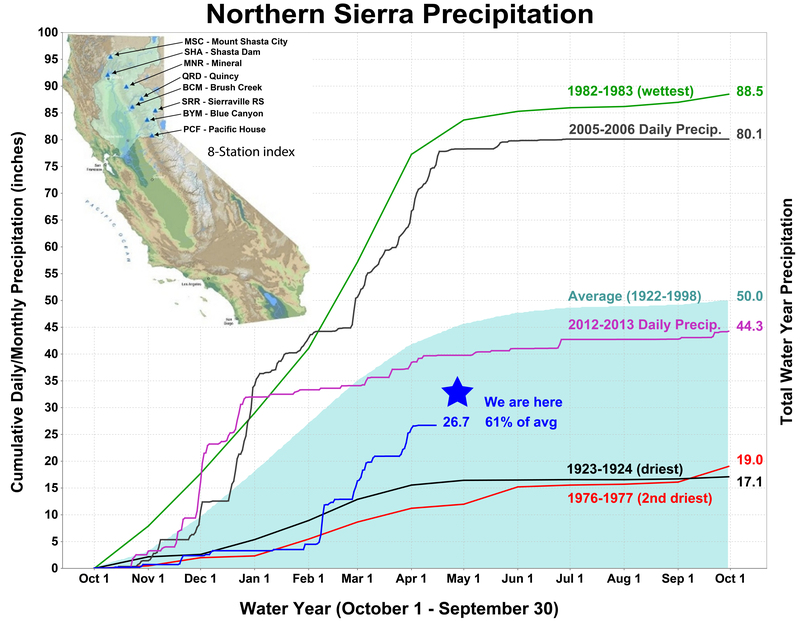 If you look at rainfall across CA, what you see is rainfall Feb-Apr was well above normal in Feb, a lot of averages in Mar, and above normal in Apr. 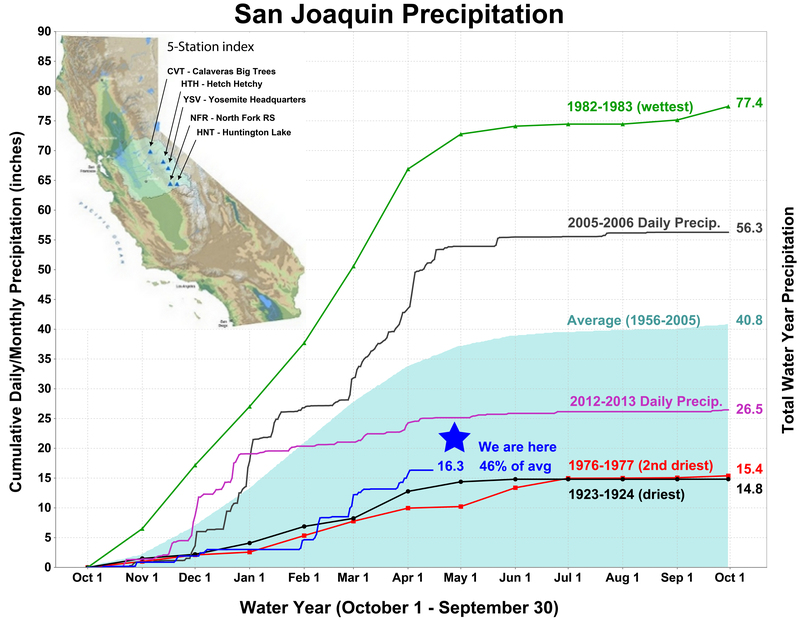 Problem with storage and reservoirs is we had 25% or less rain/snow in Oct thru Jan. It’s tough to tell where the trend begins and ends, but even late April added two feet plus of snow above Sacramento and to the South. That would put a lake like Folsom up to 650K acre feet which is pretty extra ordinary considering where it started the year and that virtually no rain/snow fell for 4 months of the water year.